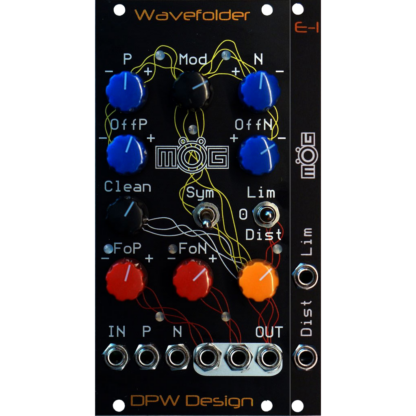 WF-1 is a Eurorack format wavefolder with some extra functions. It can be used for audio signal manipulation or as a utility module for control voltages. Video demo can be found here. SonicState interview video and a DivKid interview video. It has an IN singnal that can be affected by the two control voltages P and N. The main output volume is controlled by the orange OUT knob. The lines on the front panel are not just decoration. They are there to help understand the function of the module. White lines shows the clean signal path from IN that can be blenden in to the main mix ont on OUT. The level of clean signal is set on Clean. Yellow lines shows the modulation signal path. P is the folding of the positive side of the IN signal and N is the folding of the negative side. Both sides has the same controls. OffP is the offset signal, or threshold where the positive folding starts. Turned fully clockwise it will be above +5V and not affect an audio signal on the input. In the middle possition it will start foldig from 0V. Turning it further anticlockwise will make the possitive folding start on the negative side, can be set all the way down to -5V. OffN has the same function but is of cause polarity switched compared ti OffP. This means that turning both OffP and OffN max clockwise there will be no folding. Knob P and N are attenuverters for adding CV control on top of the offsets OffP and OffN. Green/red LEDs show what are being added be the attenuverters. The over all control of the ammount of modulation is controlled by Mod. A gree/red LED after the Mod control is showing the total combined modulation from the P and N side. The switch Sym can change asymerical to symerical modulation. That is when Sym is on all modulation on P will be copied over to N and vice versa. In Sym mode OffN is disconnected, it would otherwise be in conflict with OffP. FoP and FoN are logical signals that goes high when folder P respective N is active. Indicated by gree/red LEDs. These signals are +/-5V so they can be used as audio signals. This is not a clean square wave, it has been shaped a bit to sound better. The red knobs FoP and FoN are attenuverters. The output from them are normalized to the main mix OUT. This means that you could add or subtract a square waves that coinsides with the folding. 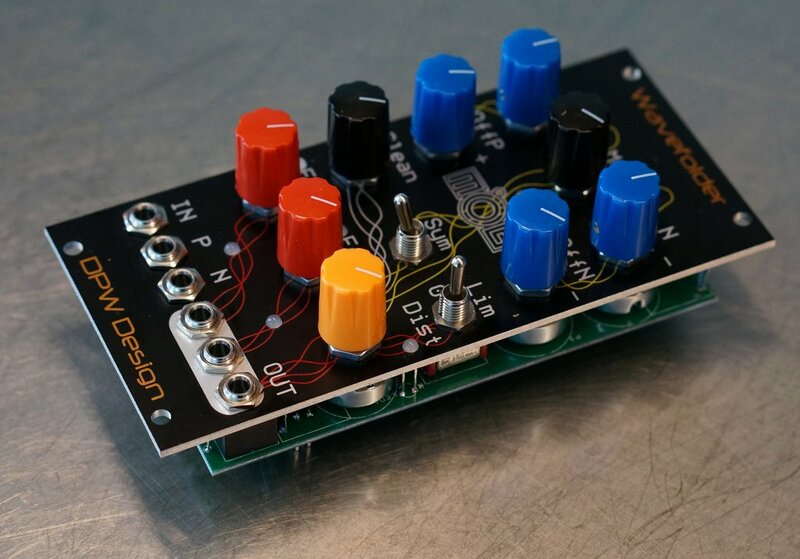 With all the folding and adding of signals the output can easily end up with more than +/-5V so a limiter/distortion switch is added to limit the maximum volume out and to add some extra sonic possibilities. This affects the signal going out to the SUM output. Middle possition 0, bypassed. The output volume control has a range of 0 to 1 times amplification. Lim possition, a soft stepped limiter that adds a lot of harmonics. Not made to be transparent. The volume control has a range of 0 to 5 times amplification to be able to drive signals harder in to the limiter. Dist possition, almost Fuzz type of distortion, frequency dependent. The highs are rolled off a bit. The volume control has a range of 0 to 20 times amplification so it can be drived really hard in to the distortion. Both the limiter and distortion are DC coupled and of cause works with control signals. When something is connected to FoP or FoN that signal is disconected from the main mix at SUM. This makes it possible to patch the three outputs from the module in many creative ways. As an example OUT can be a mono signal and FoP and FoN be treated as a stereo out for very big sounds. The unit is 12hp wide and 27 mm deep including power connector. 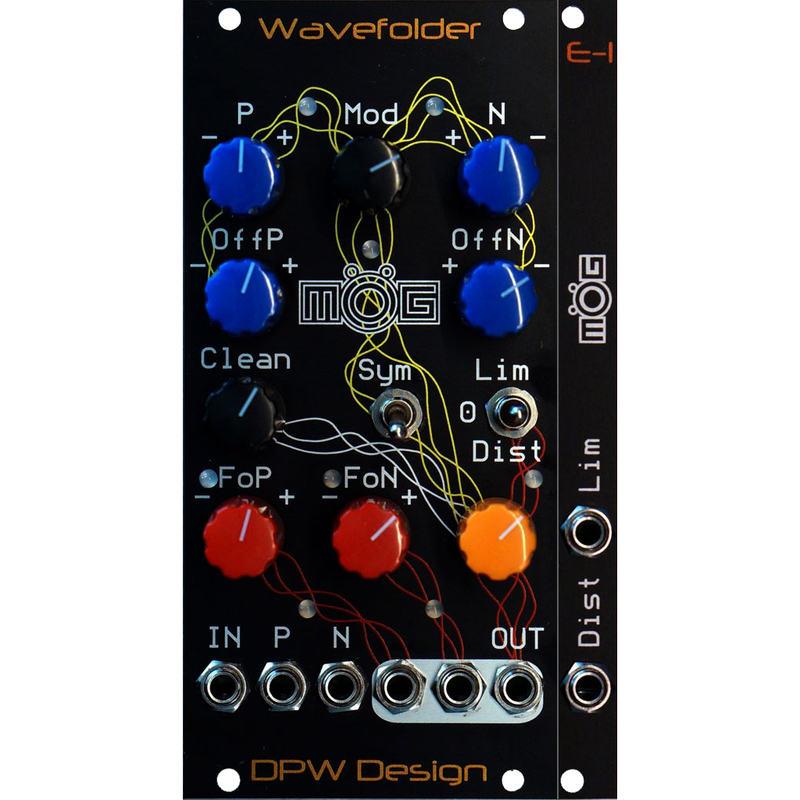 The Wavefolder expander E-1 allows you to CV control on and off of the Lim and Dist functions. One way to use this is as two types of CV controlled accent to the main output of the WF-1. You can actually turn it on an off at up to about 1,5 kHz speed giving a sort of frequency modulation effect.